Salem, eighth grade student young girl who was alone in the house the night of the day before yesterday, was shot in the neck cut. The new motor bike, helmet, and a student wears a cap with the murder of two young people are less inclined to be arrested immediately after the student's parents have complained that. Salem, the city belongs to the Vanniyar Periyaputhur near Alakapuram Durairaj (45) who has served Salem Seelanayakkan patti private granite company manager. His wife Kasturi (38). Their second daughter Tejasree, was studying the 8th grade in a private school in Alakapuram. 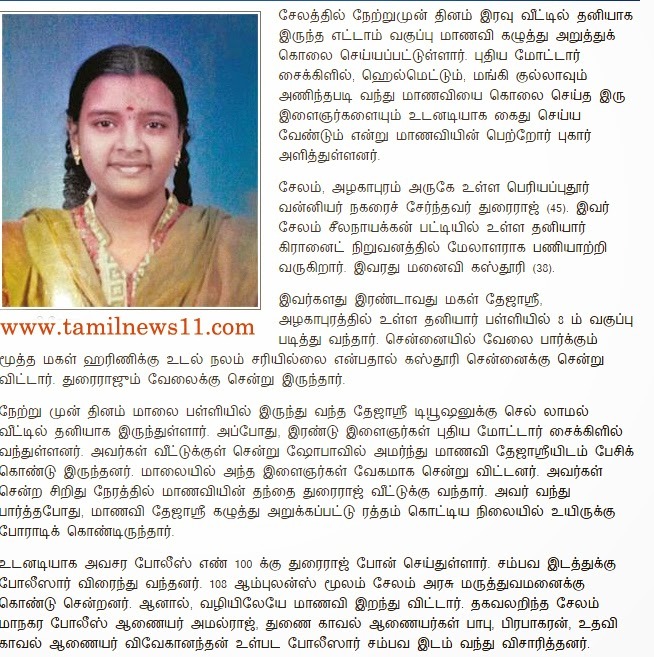 Harini eldest daughter to work in Chennai is not well Mother moved to Chennai. Durairaj was going to work. 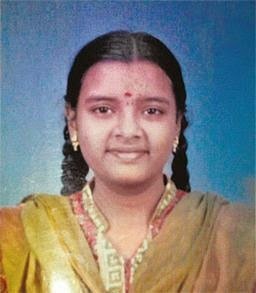 The day before yesterday evening, Tejasree came from school and not go to tuition , she was alone at home. The two young men arrived at a new motorcycle. They went home and talk with student Tejasree in the Shobha. In the evening, the young people have gone faster. In the short time they came to the house of her father Durairaj. When he arrived, she was fighting for his life in Dejasri neck cut, drenched in blood. Immediately call the emergency police number 100 by Durairaj. Police rushed to the scene. He was rushed to Salem hospital by ambulance 108. However, she died on the way.